Remember last year when a sale featuring laptops priced at $500 caused a stampede in one store. What a difference a year makes! Laptop prices have been steadily dropping, falling below those stampede prices in some cases. As productions costs come down and the marketplace is flooded with all makes of laptops, you can expect laptop prices to drop even further. No news there, most products come down in price eventually, electronic products are no different. Actually, they seem to come down in prices more rapidly. This is written by someone who bought a $1000 VCR - now you can get the same VCR for under a hundred bucks. If you can get anyone to buy it. For that matter, do they sell VCRs anymore? Have you bought a TV lately? You may have been surprised at the different ones - Plasma, LCD, Rear Projection - and just look at the prices on the old fashion TVs, they have become downright cheap, compared to what they once were. When one technology is replaced with another you can usually find some nice discounts and cheap prices. Many consumers confuse the word cheap with poor quality - don't make the same mistake. In most cases, you're still getting a high quality product; just at a lower price. There is a similar thing going on with laptops or notebook computers. A few years ago, compared to buying a PC, buying a laptop was very expensive. Now laptop prices have fallen. New technologies have come on stream, most notably the new Intel Duo processor. Rightly or wrongly, it makes a lot of older laptops somewhat obsolete. But these older laptops are still high quality products that you may be able to purchase at a cheaper price. But the million dollar question remains - are cheap laptops worth your hard earned money? As a prudent shopper you have to be careful and know exactly what you're purchasing. A cheap laptop that will break or not perform up to our expectations is not cheap - just a waste of your hard earned money. So you have to be careful and play it safe, always go with a high profile laptop maker. HP, Sony, Apple, Toshiba, Dell, Panasonic... many of these companies do sell inexpensive laptops. They also sell perfectly fine refurbished laptops that you should also consider if you're interested in buying a cheap laptop. Many of these big name laptop makers do offer special deals and discount coupons. Many good quality laptops can now be bought for well under $1000. No matter what type or kind of laptop you buy or from whom, always check the warranties and know exactly what is covered should you run into problems with your newly purchased laptop. However, you must always try to get the best value for your money. You must comparison shop and look closely at what you're getting for your hard earned cash. Look at the processing speed, look at the amount of RAM, look at the graphics and visuals/display, try out the feel and touch of the keyboard and touchpad - do they meet or perform to your satisfaction? Look closely at the different features and ask yourself: do you need a wireless connection? do you need a large hard drive? 40-80-100 gigs? do you need a DVD burner? do you need long battery life? (if you're just using your laptop as a desktop replacement and it will be plugged in all the time, long battery life may not be that important). What connections do you need? How many USB ports? Firewire? Keep all these features in mind when buying your laptop. A cheap laptop isn't cheap if it doesn't give you all the features you want. To be fully satisfied with your purchase, your cheap laptop must have all your requirements (things you just can't live without on your laptop) included in that cheap price. In other words, you must make sure you're getting good value for your money. Make sure you're getting a high quality laptop with all the features you need or require in your laptop for a decent price. Why buy a fully loaded laptop when you will never use a webcam or DVD burner. Why buy a 100 gig hard drive when you don't and will never need all that storage space? Instead, find the features you want and then go bargain hunting for a laptop within your price range. 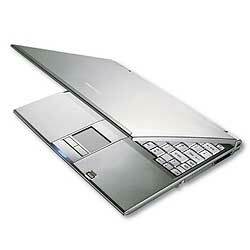 The Internet is an excellent place to start your comparison shopping for a quality inexpensive laptop. Most, if not all of the major laptop makers have online sites where you can find some great laptop discounts and laptop deals. Many online stores and affiliate sites will also give you some great laptop bargains, so shop around. Dell is well known for its online laptop coupons and discounts. Using Dell coupons will get you a cheaper laptop. Many other laptop makers like Toshiba and HP offer great online deals and discounts - so make sure you look around before you buy that cheap laptop. And don't forget eBay, but be careful of what you're buying and always thoroughly check out the seller as well as the product. Remember "It isn't cheap if it doesn't work!" Still, if you're on a limited budget it pays to do your homework and shop around. There are some great bargains to be had, but don't be fooled by all those low prices. Just make sure your cheap laptop has all the features you need or can comfortably accept without too much disappointment. Make sure your cheap laptop is in fine working order and has a nice warranty attached to it. Then and only then, can you be assured that your cheap laptop is well worth your money. For more information on Buying Notebooks and Laptops at Bargain Prices Go Here: Cheap Laptops or Try Here: Dell Coupons . 2006 Titus Hoskins This article may be freely distributed if this resource box stays attached.